Editors: Sigurdsson, Haraldur, Houghton, Bruce and McNutt, Steve, et.al. 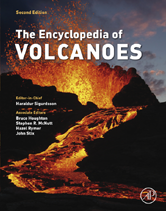 This 2nd fully revised and updated edition provides a comprehensive source of information on the multidisciplinary influences of volcanic eruptions--both destructive and beneficial. 2 What Are Lava Flows? 4 How Might LIP Volcanism Affect the Atmosphere and Environment?